Last Sunday, on top of the bagels and the garden vegetable spread (that totally grows on you as you eat more and more! ), I also made some muffins. 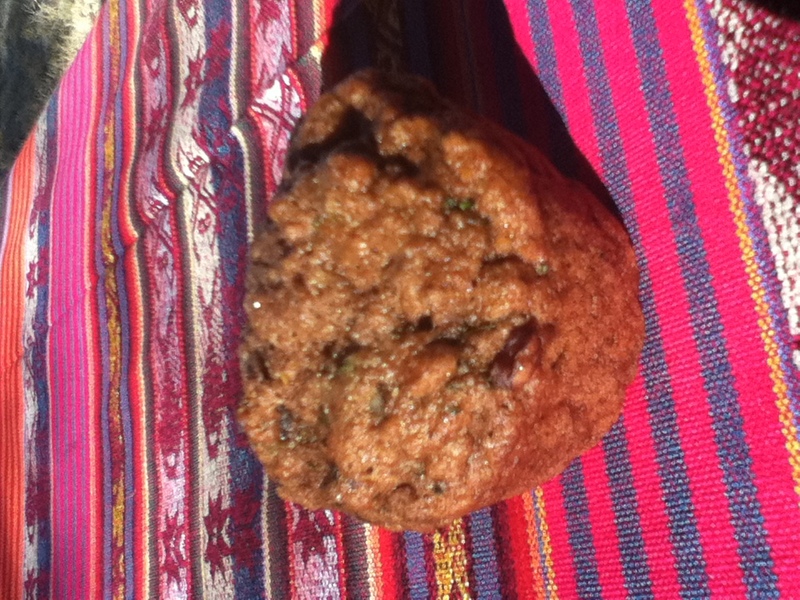 Zucchini Pecan Spelt Muffins, to be exact. I got the recipe from Vegan Brunch, and modified it slightly, partly on purpose, and partly by accident. When I first saw the recipe (and the lovely picture in the cookbook), I immediately thought of these delicious, large, soft, fluffy, moist muffins that I used to get from a coffee shop, before I started this whole vegan experiment. The muffins were made with some sort of non-white flour, they were zucchini muffins, but they also had some sort of nuts in them (either walnuts or pecans, I’m not sure which) and a good handful of nuts on top of the muffin, as well. I would stick the muffin in the microwave for 55 seconds before eating, and it was delicious. Steamy and warm and fatty and delicious. So, I saw this muffin and decided I wanted to replicate the bakery muffin. So, in addition to the zucchini and spelt flour, I needed to add some chopped nuts. I think I ended up adding about 1/3 to 1/2 cup of chopped pecans to the batter. I also sprinkled some on top of half the muffins. The one downside was, I had only about half of the required zucchini. I even went to the store specifically FOR the zucchini, and failed to buy the right amount. So, I made due with half the amount. The muffins were maybe a little drier than they should have been (had I added 2 cups of zucchini instead of only one), but they were still mighty good. Unfortunately…I left them out on the counter for two days, and in the hot desert heat, I think they started to go back pretty quickly. I immediately shuttled them to the refrigerator, but, now they taste a little…funky.